The Marmite Jar Chandelier has been designed partly to provide an interesting piece for the home and partly to serve as a functioning lamp providing a modest amount of illumination for say a TV or music room. Of course, it was paramount that the lamp could run on a 12V DC power supply. The lamp as we describe here uses a mere 6 watts so could also run from a 12V DC wall wart without problem as long as it was able to muster around 1000ma / 1 amp. 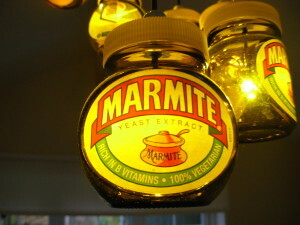 Why use Marmite Jars? 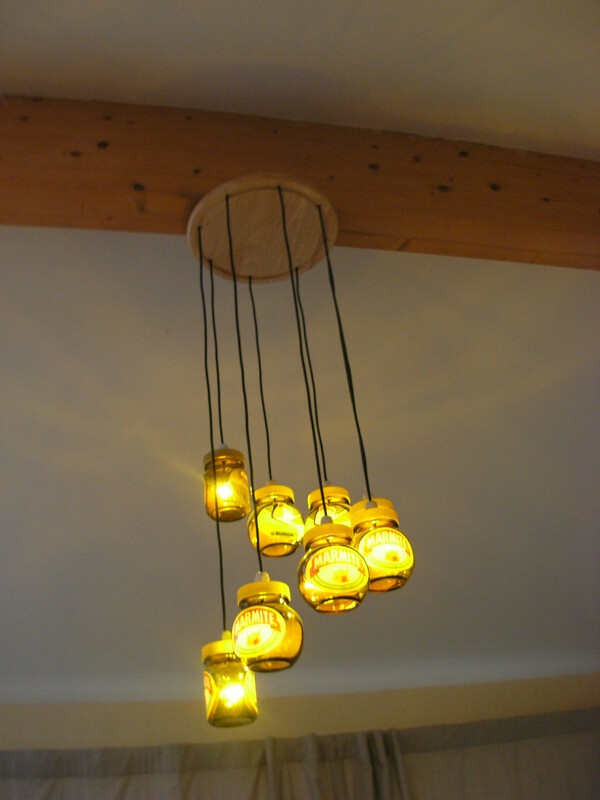 Well, we (okay, I) love Marmite so much and thought these little jars were so cute, just perfect to make an interesting light fitting for the home. The colour that is produced when the light shines through the amber tinted glass is just superb. Now the hardest part of this job seriously, is getting hold of enough empty jars. Of course, if you really are a Marmite fan, it may not take too long to stock up on the quantity of jars required (as in this case we used just 8 bottles). You can always ask family and friends to provide the empty jars you require (related children could also ask their buddies at school). 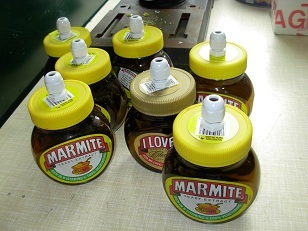 1) 8 X Marmite jars complete with lids. You may prefer to remove the labels but we actually think it’s rather cool to leave them. 3) A suitable length of small diameter 2 core cable; quality bell wire or other low voltage cable will suffice. If you need to use a larger diameter cable (such as regular 2 core .75mm lighting flex) that will be fine also, just be sure the cable is clean in good order, and has no ugly kinks. Also bear in mind compatibility with the gland size (PG7 glands suit cable diameter in the following range: Metric: 2.5mm to 6.5mm or Imperial: 0.098″ to 0.256″). This is the external size of the cable. 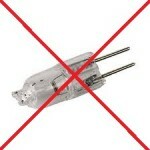 4) 8 X 12V lamps in a G4 two pin fitting. 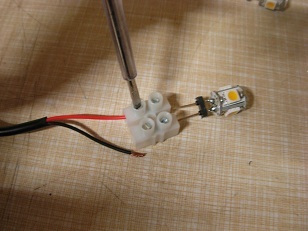 We used very low energy LED lamps rated around .75 / ¾ watt 12v DC. You can use up to around 2 Watt rating, especially if you are aiming for a brighter, more powerful lamp to attain a high light output. 5) 1 X 25cm Bread Board (to suspend the jars from). 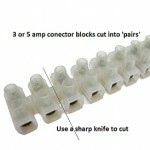 6) 2 X 3 or 5 Amp connector block strips. Drill bits of 7/16th (or slightly larger / approx. 11mm to 13mm metric) and ¼ inch. 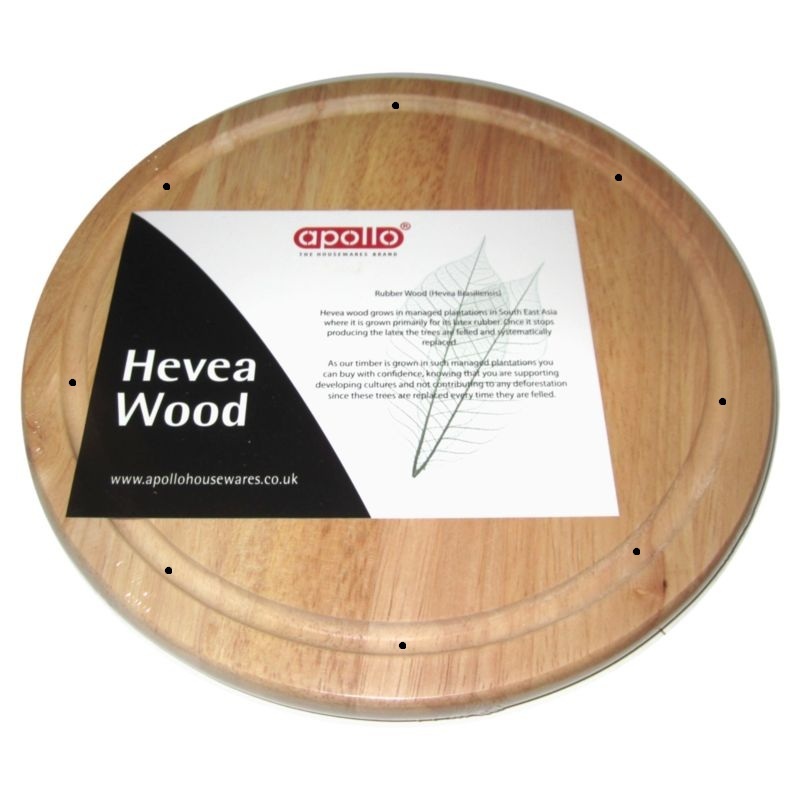 Now of course you will need to be confident in using a power drill to make the holes in the breadboard, if not, we recommend asking a confident friend or relative to assist with this. Gently and slowly is how we drill all the holes. 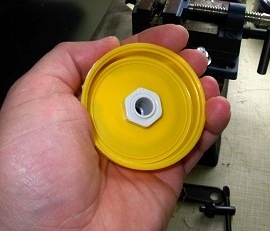 Take special care and carefully drill the holes in the plastic lids to accept the PG7 cable glands. Mark the breadboard so that all holes will be drilled ‘equidistantly’ (all equally / evenly spaced). Drill these holes for the lamp cables using the ¼” drill bit (or larger if your cable is larger). Refer to the image here and you will see we drilled into the recess. Be sure to keep the holes straight. We suggest placing a piece of waste wood underneath whilst drilling. 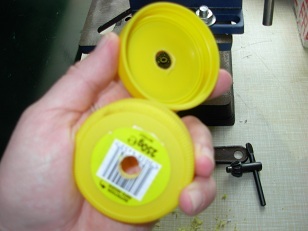 Next, mark the hole centres on the plastic Marmite Jar lids with a black indelible pen / permanent marker. 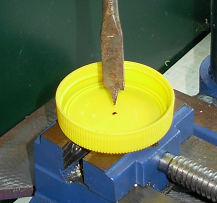 If you can use a carpenters drill bit as in the image here, the point will be easy to guide into the exact centre. Trim afterwards using your sharp knife to remove any rough edges and / or to make the hole a good fit to the PG7 glands. Get the hole started carefully to ensure central positioning. You don’t want the Jar to hang wonky now do you. Prepare the ends of you cables so that they can be connected to your LED lamps. 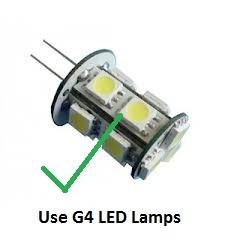 You may solder them if you are confident with a soldering iron or you can take the simple route of using small (3A) connector blocks or dedicated G4 lamp sockets. Cut the cable lengths so that the jars will hang in the correct positions. Each cable will need to be shortened according to how much ‘drop’ you require. Soldered joints will need to be wrapped with a small section of electrical tape to prevent short circuits. Remove the back nut from the gland and insert the cable complete with attached LED, pull the cable through. Set the length so that the lamp is set into the Marmite Jar at the correct height by clamping the back nut of the PG7 gland at the same point for all the lamps. We recommend using LED lamps of a G4 fitting 12v DC in this case. 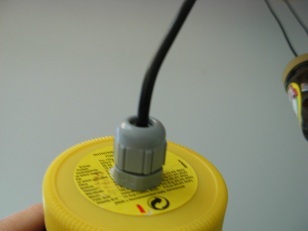 You can use a quick setting adhesive if needed to fix the cable at the mounting holes and prevent strain on the connector blocks. Cut the connector blocks into pairs and fix to the bread board just outside of the wire entry holes for the jars and fix with one small wood screw. Use the same type of connector block to connect the LED (if you are not soldering). Join the LED onto your cable being careful to observe positive (+) to red wire and black connecting to the negative (-) of the LED. Pull the cable through the lid / gland so that the LED is positioned within the ’jar’ at about the right height to be midway within the Jar. Final cable lengths for the ‘drop’ will be based on your preference and available headroom. We spaced each lamp about part way up to the next lamp: Lid of first approximately centred to be adjacent to the middle of the next lamps label, etc. Tighten the gland well so that it clamps onto the cable firmly. 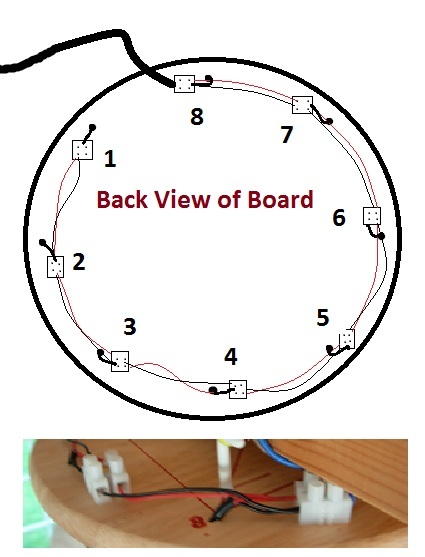 Pull each cable up through the breadboard and fix into position with adhesive or cable clamp. Insert the cable into the connector block again observing proper polarity of positive and negative. That’s about it. Check all connections again then make your hook-up test to your 12v supply or battery to see that all lamps are lit and to be sure that all is well. Fix your Marmite Chandelier to your chosen position with hanging brackets, hook and eye or other fixings. Not bad eh? We think it look rather cool hanging from a nice high ceiling beam. See more at the OnSolarBlog. 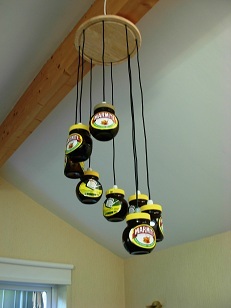 If you liked this article about building a Marmite Jar Chandelier please leave a coment.